Airbnb is destroying our communities by taking away housing from locals and renting it to tourists. More than half of the available rental properties in Dublin are being listed as short-term tourist lets. The Weeping Sink Air Quotes Ask A Broadsheet Reader Air Fair? Posted in Misc and tagged Airbnb at 10:36 am on June 21, 2018 by Bodger. I’d happily see Air BnB banned, or at least have the taxes on profits so high to make it prohibitive. I’ve never heard that quote before, but it is true and disturbing. There needs to be limits placed on Air B&B, I think they severely limited it in Amsterdam and New York because of its negative effects on citizens and housing. I know property owners get a bad rap for this but from my experience most of the lets are sublets- people are taking out leases from landlords and then putting them on Airbnb. It’s very easy for someone to cover the rent in one week and the rest is profit (AirBnB may report earnings every year to Revenue but revenue have not contacted any of my friends who rent out rooms so they never declare it). Also I know two people who took out leases on two bed room apartments so that they could put the other room on airbnb to cover the rent on the entire place and make some extra money. It’s perverse and against the idea that the website peddles. Easy solution- limit the amount of days an entire apartment can be let in one year (30 is more than reasonable) and revenue do their job in persuing the non tax compliant. why would you rent to a tenant who can stop paying rent and remain in the property for months, forcing a landlord to go to court to get an unworkable eviction notice.? thousands of rental properties leaving the market every month? 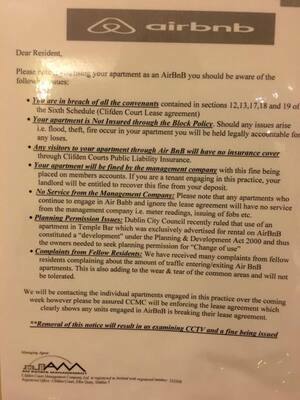 rental market is broken, airbnb are not responsible. They are partly, but not solely, responsible. There isn’t a single solution to the housing crisis and right now air bnb are definitely adding to the problem. 2500 properties went back on the rental market in Berlin after they banned it in 2016. Yes, that’s why I said they are partly, but not solely, responsible. Again, a single solution won’t solve this. Having said that, what would you suggest government policy should be? reduce mortgage interest to euro averages. cap rents and taxation on rental income. allow 100% mortgages on property up to a certain value. make it easier to evict bad tenants. My solution has always been to give all housing rentals to the local authority, without exception and provide more resources for enforcement of housing legislation . Tourist rentals, hotel, holiday homes etc should be run as a business and properly taxed. Yeah, but that only works if you have an adequate supply of local authority housing. You’re right on the housing legislation end of things, though. Plenty landlords are pulling the scam of saying they’re selling up or doing “significant renovations” to get current tenants out and get a better rate. According to RTB’s most recent annual report there were more tenancies registered in 2016 than 2015. There were 106,075 in all of 2016; are you suggesting that there will be fewer than 90,000 this year? where are the rental properties going olllie? Are they disappearing? No Andrew, the rental black market is fast growing because both landlord and tenants benefit from not having to hand over half the transaction to the government. A whole swathe of American based non paying tax companies have had to close as a result..
the fines for operating this way now are huge and there is a special team from the town halls on the street policing for this. I would imagine the Parisian bureaucracy and the ever-proactive residents’ associations that exist in even the most crumbling of apartment blocks help to spur things along much more than is currently achievable in Dublin, sadly. Why should we rely on private individuals to sort out the housing crisis. The current Government and those who came before them have ignored the basic fact that the state need to provide housing for those who are most in need. I am lucky enough to own my own house, the house I live in is an ex council house that was built in the 1930s, these were properly planned housing schemes with proper amenities for the tenants, a park and a library…… The state has passed the buck to greedy private developers for too long, who over the years have provided a vast amount of sub standard houses at extortionate prices, many of which will not be standing in 90 years time. Why should we rely on private individuals to sort out the housing crisis? I don’t think we should- government should stimulate building to meet demand and not boast about falling short bu about 20,000 units. However, the taxes on Airbnb earnings should be high as it has a negative effect on an already bad situation. Just ban it as a commercial activity taking place in residential property. Change of use should be required and declined. is this your first moderation Papi ? We’ve had decades of poverty and recession, yet local authorities were able to build swathes of quality housing estates to house those that needed them (including my own family). We had 9 years of a boom and suddenly no houses can afford to be built by the same local authorities that managed to put up thousands of houses in the 60s-90s. Ireland is a vastly richer place than 50 years ago, with far less poverty. There have been two (short) periods of actual recession. I think your point is: “Why was it possible to build many more social houses when average incomes were much lower?” and is very pertinent. Ireland was a poor country with high unemployment for most of the 20th century i.e. decades. Yes. But it has got a HUGE amount richer. Living standards are not quite at Swiss levels, but still better than about 95% of the world’s population. we are paying 9 billion a year to service bank debt. thats why, to protect those alglo irish bank vested interests. loan approval files with blank sheets of paper in them, false loanee names, ask the central bamk where they were while Drumm was riding us? it was ‘only’ 6 billion last year. Absolutely agree. We (government) need a massive building programme delivering good quality affordable housing. Not just shacks to get people out of hotels. Not 20% of private developments. Real, planned, affordable housing for people who need social housing and for families who need affordable, decent homes. The private sector has had a good long go and has failed. AND, they’re a foreign business with an office in Dublin, the government won’t do anything to upset them. However, banning air bnb is not the answer. Ban the people who just have their gaffs on air bnb full time. theyre the ones taking up living space. but for people who rent their own house out now n again to help with rent, thats fine, that’s how its meant to be all along. just the greedy irish latched on to it and misused it. That’s not a bad idea, maybe make it so that you can only put a room on airbnb if it’s part of your primary residence.That way you can’t have flats whose sole occupants year round are short-let tourists, there’ll have to be at least one long-term renter. Housing is a Ponzi scheme. When will the bubble burst? The only way out, apart from a burst bubble with all its hideous effects, is for the councils to start building again. This horrifies Fine Gael because they believe so deeply in privatisation, but it’s the only way out. 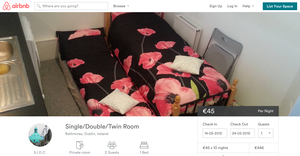 There are different types of AirBnB – people letting out the boxroom occasionally is one thing (they’re unlikely to let it permanently to a lodger), people buying apartment blocks to rent them out to tourists by the day or week is another. Alternatively you can give you property to the council , and they will rent it out for you, make sure its returned to you in good shape, and if they don’t have a tenant they will still pay you . 80% of market rates and 52% tax.that leaves less than 30% of the rental income for the landlord. No. You only pay 52% on the 80% you end up with 38% of the original rent. there’s a line being peddled in the media at the moment that it simply doesn’t pay these days to be a landlord. it’s not true, if you’ve any level of cop and savvy, it’s very worthwhile. Agreed – it is not as simple as I made out. My point (badly made) was that the 20% you ‘lose’ to the council is really only 10% (after tax) *and* you have none of the hassle or costs that you mentioned above. i don’t know how students without parental support survive college these days. Minimum wage has not come up much since I was in college (07-11) but the rental price of a single room sure has. If ignoring the people across the hall from you for the whole time you / they live in the apartment complex is community I’m not exactly sure what Airbnb is destroying. I’m pretty sure rehousing people from tenement areas to the outskirts of the city killed community, then heroin, then neglect.